Preregistration is required to participate in this competition. Preregistration closes at midnight AWST on April 12th, 2018. 1st place will be presented with small trophy representing their achievements, with $150 cash and prizes. 2nd place will be presented with $100 cash and prizes. 3rd place will be presented with $50 cash and prizes. Prizes are courtesy of Madman and Siren Visual. This official application form must accompany all entries. A maximum of 5 entries per photographer. Entries must be submitted for pre-judging in a digital format through the application form form below or via email (info@evolveperth.com) not exceeding 5MB in size. Entries must not be watermarked. Please be aware that Evolve is a family friendly event with younger attendees. Any submissions deemed inappropriate can result in the submission being disqualified from the competition at the discretion of the venue staff. Entry forms must be 100% completed otherwise the entry will be disqualified. 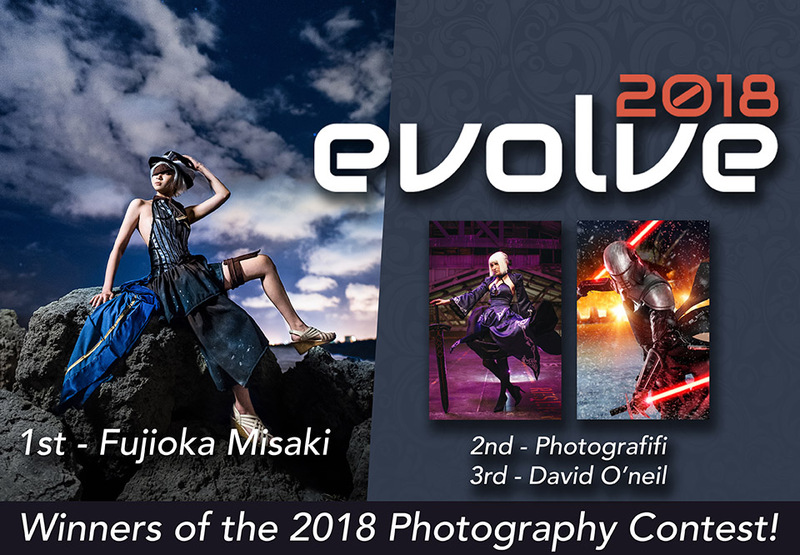 A minimum of 15 images will be selected from the pre-judging stage for display at Evolve Perth 2018. Entrants whose images are selected for the gallery stage will be notified and required to submit a print ready image formatted to 8” x 12” and no larger than 15MB in size. Gallery entries must be optimised for print, as Evolve Perth will print the images for display in the gallery area. Photos will be printed by a commercial photo printing service engaged by Evolve Perth. Entries must be sent in either on of these formats: JPG, TIFF, PNG or PDF. File names must match the entry title for easy identification. Participants are responsible for providing a valid and printable file. Files larger than 5MB must be uploaded to DropBox for Evolve Perth to retrieve. Entries sent after the deadline will not be accepted. Editing and retouching is accepted. A minimum of 15 images will be displayed in the gallery and remaining images may be displayed online with full credits to the photographer and cosplayer. Images must portray at least one cosplayer or costumed model. All entries or download links must be attached to the form below. Evolve Perth will not be held responsible for images that are lost or damaged. * Evolve Perth reserves the right to use the entry for promotional (non-commercial) purposes. * Evolve Perth reserves the right to disqualify any image or participant without prior notice. * The entry has not been published in editorial or advertisement material (online or print) prior to this submission. Social media pages and online portfolios are still allowed. * The entry will not be published (online or print) prior to the final results. * The undersigned Photographer owns the rights to the image.